This article is about two-way radio in general. For hand-held two-way radios, see Walkie-talkie. A two-way radio is a radio that can both transmit and receive a signal (a transceiver), unlike a broadcast receiver which only receives content. It is an audio (sound) transceiver designed for bidirectional person-to-person voice communication with other users with similar radios using the same radio frequency (channel). Two-way radios are available in mobile, stationary base and hand-held portable configurations. Hand-held two-way radios are often called walkie-talkies, handie-talkies or hand-helds. Two-way radio systems usually operate in a half-duplex mode: the operator can talk, or he can listen, but not at the same time. A push-to-talk or Press To Transmit button activates the transmitter; when it is released the receiver is active. Other Full-duplex is generally achieved by the use of two different frequencies or by frequency-sharing methods to carry the two directions of the conversation simultaneously. Methods for mitigating the self interference caused by simultaneous transmission and reception on different but close-spaced frequencies include using two antennas, or dynamic solid-state filters. Time-division technologies (such as TDD) are used for mitigating self interference by simultaneous transmission and reception on the same frequency. Installation of receivers and transmitters at the same fixed location allowed exchange of messages wirelessly. As early as 1907, two-way telegraphy traffic across the Atlantic Ocean was commercially available. By 1912, commercial and military ships carried both transmitters and receivers, allowing two-way communication in close to real-time with a ship that was out of sight of land. In 1933, the Bayonne, New Jersey police department successfully operated a two-way system between a central fixed station and radio transceivers installed in police cars; this allowed rapidly directing police response in emergencies. During World War II walkie-talkie hand-held radio transceivers were extensively used by air and ground troops, both by the Allies and the Axis. Early two-way schemes allowed only one station to transmit at a time while others listened, since all signals were on the same radio frequency – this was called "simplex" mode. Code and voice operations required a simple communication protocol to allow all stations to cooperate in using the single radio channel, so that one station's transmissions were not obscured by another's. By using receivers and transmitters tuned to different frequencies and solving the problems introduced by operation of a receiver immediately next to a transmitter, simultaneous transmission and reception was possible at each end of a radio link, in so-called "full duplex" mode. The first radio systems could not transmit voice. This required training of operators in use of Morse code. On a ship, the radio operating officers (sometimes shortened to "radio officers") typically had no other duties than handling radio messages. When voice transmission became possible, dedicated operators were no longer required and two-way radio use became more common. Today's two-way mobile radio equipment is nearly as simple to use as a household telephone, from the point of view of operating personnel, thereby making two-way communications a useful tool in a wide range of personal, commercial and military roles. Two-way radio systems can be classified in several ways depending on their attributes. Conventional radios operate on fixed RF channels. In the case of radios with multiple channels, they operate on one channel at a time. The proper channel is selected by a user. The user operates a channel selector (dial or buttons) on the radio control panel to pick the appropriate channel. In multi-channel systems, channels are used for separate purposes. A channel may be reserved for a specific function or for a geographic area. In a functional channel system, one channel may allow City of Springfield road repair crews to talk to the City of Springfield's road maintenance office. A second channel may allow road repair crews to communicate with state highway department crews. In a wide-area or geographic system, a taxi company may use one channel to communicate in the Boston, Massachusetts area and a second channel when taxis are in Providence, Rhode Island. This is referred to as Multisite operation. In this case, the driver or the radio must switch channels to maintain coverage when transitioning between each area. Most modern conventional digital radios and systems (i.e., NXDN and DMR) are capable of automatic "roaming" where the radio automatically switches channels on a dynamic basis. The radio accomplishes this based on the received signal strength of the radio repeater's recurring "beacon" signal and a "site" or "roam" list that identifies available geographic channels. Some analog conventional systems can be equipped with a feature called "vote-scan" that provides more limited roaming (rarely used in practice). Radio "simulcast" technology can also be used in adjacent areas, where each site is equipped with the same channel. Here, the transmitters must be closely synchronized, and a centralized voter or receiver comparator device is required to select the best quality signal from the mobile radio. This is often used in public safety and utility radio systems. In marine radio operations, one channel is used as an emergency and calling channel, so that stations may make contact before moving to a separate working channel for continued communication. Motorola uses the term mode to refer to channels on some conventional two-way radio models. In this use, a mode consists of a radio frequency channel and all channel-dependent options such as selective calling, channel scanning, power level, and more. Some conventional radios scan more than one channel. That is, the receiver searches more than one channel for a valid transmission. A valid transmission may be a radio channel with any signal or a combination of a radio channel with a specific Continuous Tone-Coded Squelch System (CTCSS) (or selective calling) code. Some radios allow an option for user-selected scan: this allows either lockout of pre-selected channels or adding channels to a scan list by the operator. The radio may revert to a default scan list each time it is powered off or may permanently store the most recent changes. In professional radios, scan features are programmable and have many options. Scan features can affect system latency. If the radio has a twenty channel scan list and some channels have CTCSS, it can take several seconds to search the entire list. The radio must stop on each channel with a signal and check for a valid CTCSS before resuming scanning. This can cause missed messages. For this reason, scan features are either not used or scan lists are intentionally kept short in emergency applications. Part of APCO Project 16 set standards for channel access times and delays caused by system overhead. Scan features can further increase these delays. One study said delays of longer than 0.4 seconds (400 milliseconds) in emergency services are not recommended. No delay from user push-to-talk until the user's voice is heard in the radio's speaker is an unattainable ideal. As with wide-area geographic conventional systems, geographic trunked radio systems require the user to switch channels as they travel unless the radio is equipped with automatic roaming. As of 2018, most all modern trunked radio systems were capable of automatic roaming. Visual clues a radio may be trunked include the 1) lack of a squelch knob or adjustment, 2) no monitor button or switch, and 3) a chirp (made famous by Nextel) showing the channel is available and ready at the moment the push-to-talk is pressed. Simplex channel systems use a single channel for transmit and receive. This is typical of aircraft VHF AM, citizen's band and marine radios. Simplex systems are often legacy systems that have existed since the 1930s. The architecture allows old radios to work with new ones in a single network. In the case of all ships worldwide or all aircraft worldwide, the large number of radios installed, (the installed base,) can take decades to upgrade. Simplex systems often use open architectures that allow any radio meeting basic standards to be compatible with the entire system. Advantage: as the simplest system configuration, there is reliability since only two radios are needed to establish communication between them, without any other infrastructure. Duplex channel systems transmit and receive on different discrete channels. This defines systems where equipment cannot communicate without some infrastructure such as a repeater, base station or Talk-Through Base. Most common in the US is a repeater configuration where a base station is configured to simultaneously re-transmit the audio received from mobile units. This makes the mobiles, or hand-helds, able to communicate amongst one another anywhere within reception range of the base station or repeater. Typically the base or repeater station has a high antenna and high power, which allows much greater range, compared with a ground vehicle or hand-held transceiver. Duplex systems can be divided into two types. The term half-duplex refers to systems where use of a push-to-talk switch is required to communicate. Full duplex refers to systems like mobile telephones with a capability to simultaneously receive and transmit. Repeaters are by nature full duplex, most mobiles and almost all handhelds are half duplex. Advantage: duplex channels usually allow repeater operation which extends range (in most cases due to increased transmit power and improved aerial location / height) – especially where hand-held radios are in use. In two-way radios with headsets, a push-to-talk button may be included on a cord or wireless electronics box clipped to the user's clothing. In fire trucks or an ambulance a button may be present where the corded headset plugs into the radio wiring. Aircraft typically have corded headsets and a separate push-to-talk button on the control yoke or control stick. Dispatch consoles often have a hand-operated push-to-talk buttons along with a foot switch or pedal. If the dispatcher's hands are on a computer keyboard, the user can step on the foot pedal to transmit. Some systems have muting so the dispatcher can be on a telephone call and the caller cannot hear what is said over the radio. Their headset microphone will mute if they transmit. This relieves the dispatcher of explaining every radio message to a caller. One example of analog radios are AM aircraft radios used to communicate with control towers and air traffic controllers. Another is a Family Radio Service walkie talkie. Analog equipment is less complex than the simplest digital. Examples of digital communication technologies are all modern cellphones plus TETRA considered to be the best standard in digital radio and being the baseline infrastructure for whole of country networks, including manufacturers such as DAMM, Rohill, Cassidian, Sepura and others, APCO Project 25, a standard for digital public safety radios, and finally other systems such as Motorola's MotoTRBO, HQT's DMR, Nextel's iDEN, Hytera's DMR, EMC's DMR, and NXDN implemented by Icom as IDAS and by Kenwood as NEXEDGE. Only NXDN and Mototrbo are proprietary DMR is an ETSI open standard. Advantage: More simultaneous talking paths are possible and information such as unit ID, status buttons, or text messages can be embedded into a single digital radio channel. The interoperability standard of TETRA means that any brand TETRA radio can work with any Brand TETRA infrastructure, not locking the user into expensive and proprietary systems. Disadvantage: Radios must be designed to the same, compatible standard, radios can become obsolete quickly (although this is mitigated by properly implemented interoperability standards such as those set down by ETSI for TETRA), cost more to purchase, and are more complicated. Some two-way digital systems carry both audio and data over a single data stream. Systems of this type include NXDN and APCO Project 25. Other more advanced systems under the TETRA standard are capable of joining time slots together to improve data bandwidth, allowing advanced data polling and telemetry applications over radio. The method of encoding and decoding the audio stream is called a codec, such as the AMBE or the ACELP family of codecs. Analog systems may communicate a single condition, such as water level in a livestock tank. A transmitter at the tank site continually sends a signal with a constant audio tone. The tone would change in pitch to indicate the tank's water level. A meter at the remote end would vary, corresponding to the tone pitch, to indicate the amount of water present in the livestock tank. Similar methods can be used to telemeter any analog condition. This type of radio system serves a purpose equivalent to a four-to-twenty milliampere loop. In the US, mid-band 72–76 MHz or UHF 450–470 MHz interstitial channels are often used for these systems. Some systems multiplex telemetry of several analog conditions by limiting each to a separate range of tone pitches, for example. Digital systems may communicate text messages from computer-aided dispatch (CAD). For example, a display in a tow truck may give a textual location for a call and any related details. The tow truck driver may press an acknowledge button, sending data in the opposite direction and flagging the call as received by the driver. They can be used for analog telemetry systems, such as the livestock tank levels, as described above. Another possibility is the lubricating oil pressure in a transit bus engine, or the current speed of the bus. Analog conditions are translated into data words. Some systems send radio paging messages which can either 1) beep a paging receiver, 2) send a numeric message, or 3) send a text message. Digital systems typically use data rates in the 1,200–19,200 kilobit-per-second rates and may employ modulation schemes such as frequency shift keying, audio frequency shift keying, or quadrature phase shift keying to encode characters. Modern equipment have the same capabilities to carry data as are found in Internet Protocol. Working within the system's protocol constraints, virtually anything can be sent or received. 1940s tube-type land mobile two way radios often had one channel and were carrier squelch. Because radios were costly and there were fewer radio users, it might be the case that no one else nearby used the same channel. A transmit and receive crystal had to be ordered for the desired channel frequency, then the radio had to be tuned or aligned to work on the channel. 12-volt mobile, tube-type radios drew several amperes on standby and tens-of-amperes on transmit. Equipment worked ideally when new. The performance of vacuum tubes gradually degraded over time. U.S. regulations required an indicator lamp showing the transmitter had power applied and was ready to transmit and a second indicator, (usually red,) that showed the transmitter was on. In radios with options, wire jumpers and discrete components were used to select options. To change a setting, the technician soldered an option jumper wire then made any corresponding adjustments. Many mobile and handhelds have a limited duty cycle. Duty Cycle is the ratio of listening time to transmit time and is generally dependent on how well the transmitter can shed the heat from the heat sink on the rear of the radio. A 10% duty cycle (common on handhelds) translates to 10 seconds of transmit time to 90 seconds of receive time. Some mobile and base equipment is specified at different power levels – for example 100% duty cycle at 25 watts and 15% at 40 watts. In most modern radios these settings are done with specialized software (provided by the manufacturer) and a connection to a laptop computer. Base stations, repeaters, and high-quality mobile radios often have specifications that include a duty cycle. A repeater should always be continuous duty. This means the radio is designed to transmit in a continuous broadcast without transmitter overheating and resulting failure. Handhelds are intermittent duty, mobile radios and base station radios are available in normal or continuous duty configurations. Continuous duty is preferred in mobile emergency equipment because any one of an entire fleet of ambulances, for example, could be pressed into service as command post at a major incident. Unfortunately budgets frequently get in the way and intermittent duty radios are purchased. Time delay is always associated with radio systems, but it is apparent in spacecraft communications. NASA regularly communicates with exploratory spacecraft where a round-trip message time is measured in hours (like out past Jupiter). For the Apollo program and the Space Shuttle, Quindar tones were used for transmit PTT control. Though the general life term for the two way radio is 5 to 7 years and 1 to 2 years for its accessories but still the usage, atmosphere and environment plays a major role to decide its life term (radios are often deployed in harsh environments where more fragile communication equipment such as phones and tablets may fail). There are so many speculations on the life term of two way radios and their accessories i.e. batteries, chargers, headset etc. Another source says system backbone equipment like consoles and base stations are expected to have a fifteen-year life. Mobile radios are expected to last ten years. Walkie talkies typically last eight. In a State of California document, the Department of General Services reports expected service life for a communications console used in the Department of Forestry and Fire Protection is 10 years. Two-way radios can operate on many different frequencies, and these frequencies are assigned differently in different countries. Typically channelized operations are used, so that operators need not tune equipment to a particular frequency but instead can use one or more pre-selected frequencies, easily chosen by a dial, a pushbutton or other means. For example, in the United States, there is a block of 5 channels (pre-selected radio frequencies) are allocated to the Multiple Use Radio System. A different block of 22 channels are assigned, collectively, to the General Mobile Radio Service and Family Radio Service. The citizen's band radio service (""CB"") has 40 channels. sky wave interference below 50–60 MHz and tropospheric bending at VHF. A channel number is just a shorthand notation for a frequency. It is, for instance, easier to remember "Channel 1" than to remember "26.965 MHz" (US CB Channel 1) or "462.5625 MHz" (FRS/GMRS channel 1), or "156.05 MHz" (Marine channel 1). It is necessary to identify which radio service is under discussion when specifying a frequency by its channel number. Organizations such as electric power utilities or police departments may have several assigned frequencies in use with arbitrarily assigned channel numbers. For example, one police department's "Channel 1" might be known to another department as "Channel 3" or may not even be available. Public service agencies have an interest in maintaining some common frequencies for inter-area or inter-service coordination in emergencies (modern term: interoperability). Each country allocates radio frequencies to different two-way services, in accordance with international agreements. In the United States, some examples of two-way services are: citizen's band radio, Digital Electronic Message Service (DEMS), Family Radio Service (FRS), General Mobile Radio Service (GMRS), Multi-Use Radio Service (MURS), Business Radio Service (BRS), and PMR446. The most common two-way radio systems operate in the VHF and UHF parts of the radio spectrum. Because this part of the spectrum is heavily used for broadcasting and multiple competing uses, spectrum management has become an important activity of governments to regulate radio users in the interests of both efficient and non-interfering use of radio. Both bands are widely applied for different users. UHF has a shorter wavelength which makes it easier for the signal to find its way through smaller wall openings to the inside of a building. The longer wavelength of VHF means it can transmit further under normal conditions. For most applications, lower radio frequencies are better for longer range and through vegetation. A broadcasting TV station illustrates this. A typical VHF TV station operates at about 100,000 watts and has a coverage radius range of about 60 miles. A UHF TV station with a 60-mile coverage radius requires transmitting at 3,000,000 watts. Another factor with higher frequencies (UHF) is that smaller sized objects will absorb or reflect the energy more which causes range loss and/or multipath reflections which can weaken a signal by causing an "Out of Time/Out of Phase" signal to reach the antenna of the receiver (this is what caused the "Ghost" image on old over the air television). If an application requires working mostly outdoors, a VHF radio is probably the best choice, especially if a base station radio indoors is used and an external antenna is added. The higher the antenna is placed, the further the radio can transmit and receive. If the radios are used mainly inside buildings, then UHF is likely the best solution since its shorter wavelength travels through small openings in the building better. There are also repeaters that can be installed that can relay any frequencies signal (VHF or UHF) to increase the communication distance. There are more available channels with UHF. Since the range of UHF is also not as far as VHF under most conditions, there is less chance of distant radios interfering with the signal. UHF is less affected than VHF by manmade electrical noise. 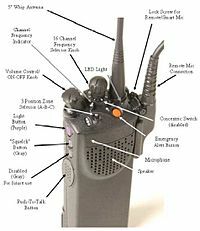 The useful direct range of a two-way radio system depends on radio propagation conditions, which are a function of frequency, antenna height and characteristics, atmospheric noise, reflection and refraction within the atmosphere, transmitter power and receiver sensitivity, and required signal-to-noise ratio for the chosen modulation method. An engineered two-way radio system will calculate the coverage of any given base station with an estimate of the reliability of the communication at that range. Two-way systems operating in the VHF and UHF bands, where many land mobile systems operate, rely on line-of-sight propagation for the reliable coverage area. The "shadowing" effect of tall buildings may block reception in areas within the line-of-sight range which can be achieved in open countryside free of obstructions. The approximate line-of-sight distance to the radio horizon can be estimated from: horizon in kilometers = 3.569 times the square root of the antenna height in meters. There are other factors that affect the range of a two-way radio such as weather, exact frequency used, and obstructions. Not all two way radios are hand-held devices. The same technology that is used in two way radios can be placed in other radio forms. An example of this is a wireless callbox. A wireless callbox is a device that can be used for voice communication at security gates and doors. Not only can they be used to talk to people at these entry points, personnel can remotely unlock the door so the visitor can enter. There are also customer service callboxes that can be placed around a business that a customer can use to summon help from a two-way radio equipped store employee. As two-way radios became the leading method of two-way communication, industries like movie and television production companies, security companies, event companies, sporting events and others needed to find a solution to use two way radios that was cost-effective and economically smart. Instead of buying two-way radios these companies began renting two-way radios short term and long term. The two-way radio rentals is a significant and important component of two-way radio businesses. Many have become reluctant to buy two way radios because of the duration of their event or the necessity to save money. Renting two way radios has brought comfort to customers in renting two way radios because the price and non commitment to owning such two way communication devices. Customers can rent anything from two-way radios to two-way radio equipment like speaker microphones or repeaters. ^ Goldsmith, Andrea (8 Aug 2005). Wireless Communications. Cambridge University Press. ISBN 9780521837163. Retrieved 20 April 2016. ^ Duarte, Melissa; Sabharwal, Ashutosh (2010). "Full-Duplex Wireless Communications Using Off-The-Shelf Radios: Feasibility and First Results" (PDF). WARP Project. Retrieved 20 April 2016. ^ Choi, Charles Q. "Chip Could Double Wireless Data Capacity". IEEE Spectrum. Retrieved 20 April 2016. ^ One example of purpose-specific channel assignments is described in Ivanov, D. A., V. P. Savelyev, and P. V. Shemanski, "Organization of Communications," Fundamentals of Tactical Command and Control: A Soviet View, Soviet Military Thought Series #18, (Washington, D.C.: Superintendent of Documents, 1977) Library of Congress Control Number: 84602565. This is a US Air Force translation of a Soviet-era, Russian-language book. See also, "Inadequate System Capacity," Special Report: Improving Firefighter Communications, USFA-TR-099/January 1999, (Emmitsburg, Maryland: U.S. Fire Administration, 1999) pp. 18-19 and "5.2 Present System," The California Highway Patrol Communications Technology Research Project on 800 MHz, 80-C477, (Sacramento, California: Department of General Services, Communications Technology Division, 1982,) pp. V-4 - V-6. ^ For an example of talk around use, see "Problem Reporting," Special Report: Improving Firefighter Communications, USFA-TR-099/January 1999, (Emmitsburg, Maryland: U.S. Fire Administration, 1999) pp. 25-26. This article also confirms the definition of the phrase talk around. ^ "Spartan Training Bulletin - Volume One – Issue One". Retrieved October 18, 2017. Ossanna, Jr., Joseph F., "A Model For Mobile Radio Fading Due to Building Reflections: Theoretical and Experimental Fading Waveform Power Spectra," Bell System Technical Journal, November 1964, pp. 2935-2971. 800 MHz trivia: this article shows that signal fades occur at audio frequencies near CTCSS tones, explaining why only DCS was used in Motorola 800 MHz systems in the 1970s. ^ See, "Appendix B - FCC Regulations," California EMS Communications Plan: Final Draft, (Sacramento, California: State of California EMS Authority, September 2000) pp.38. and Arizona Phase II Final Report: Statewide Radio Inter-operability Needs Assessment, Macro Corporation and The State of Arizona, 2004. ^ "2-Way Radio Range: How Far Can Two-Way Radios Communicate?"